Riva Tritone was, until the birth of the Aquarama, the absolute top model of the Riva yard and is considered by many, your editor included, as the most beautiful Riva of all models of Carlo Rivas Design. 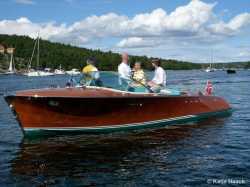 The boat listed as the first Tritone saw the light back in 1950 and was a response to many customers' desire for a larger boat that also could be used on the ocean with its rougher seas. The design that some years later would be named Tritone was the model BQ and designed for two engines. 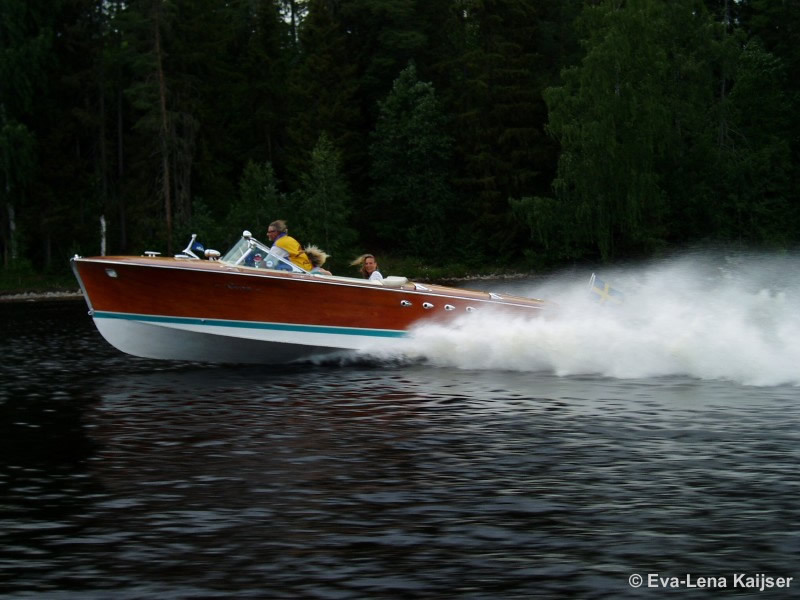 The very first boat, named Ale, is fitted with 2 Gray Marine engines at 112 hp. 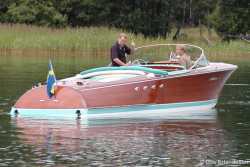 The boat is capable to make 36 knots with 2 people on board. The buyer was Prince Antonio Amato di San Benedetto di Caserta. At this time there are not many who can afford a BQ so it will take until 1952 before Carlo gets a new order. This boat, BQ #2, is not equipped as intended with twin engines. Instead it get a huge Scripps V12 (14-liter displacement) delivering 350 hp at full throttle. This engine, which includes dual ignition systems (24 spark plugs! ), is considered as one of the world's best and most reliable engine for marine use. With this engine the boat reach 43 knots. The boat's dimensions are 7.7 x 2.57 m and has, as most runabouts at this time, a split windscreen with straight glass panels set in three chromed bronze fittings on the deck. Especially for this boat, as for all Tritone made until 1957, is a front spray guard just above the waterline at the bow. From this year, the BQ model is named "Tritone" and three boats are delivered. Each one is fitted with a V12 Scripps engine. 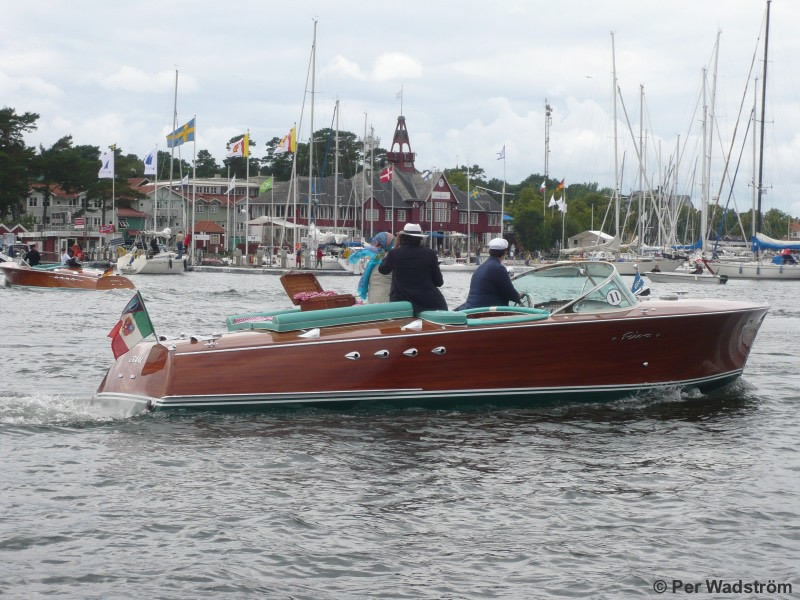 The boat has now grown to 7.9 x 2.62 m. The first one, with serial #3, is named PERLITA TOO by the buyer, the movie producer Roland Reed, and becomes the first Riva sold to the United States. 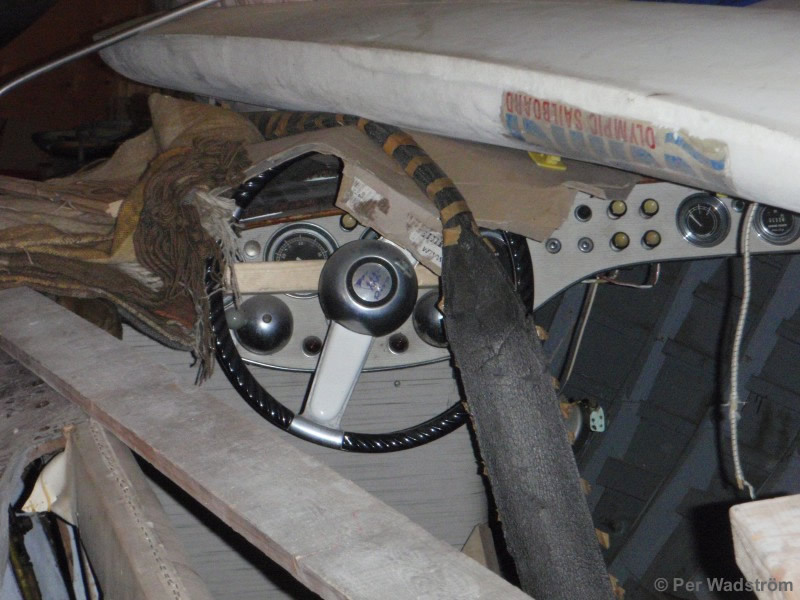 Having been seemingly missing since 1975 the boat reappears in a barn in 1989. In 2008 a restoration begun in Canada with the aim of restoring this unique boat to perfect original condition, including its monstrous Scripps engine. Twin engines is now the only standard choice and the first three boats are supplied with two six-cylinder side valve engines from Chris Craft type ML at 145 hp each. Much else is also new for the year. The boat will now have the typical panoramic wind shield made up of 4 glass parts and mounted in a chromed brass frame. This construction enables the use of a waterproof hood that could be easily attached to the wind shield frame and is a real novelty in the runabout world. The hood is made of green canvas and is stored with bows behind the rear bench seat. The dashboard is now made of the new material "Formica" with instruments from Stewart Warner with inscription "Chris Craft". Upholstery is made of dark green/white striped "Saran", a plastic material (PVDC) accidentally discovered in 1933, and very resistant to water and food spoilage... The bottom is painted with dark green antifouling paint with a waterline in white-dark green-white stripes. The air intakes on the engine hatches are moved to the sides of the deck in order to make room for a sun bed above the engines. 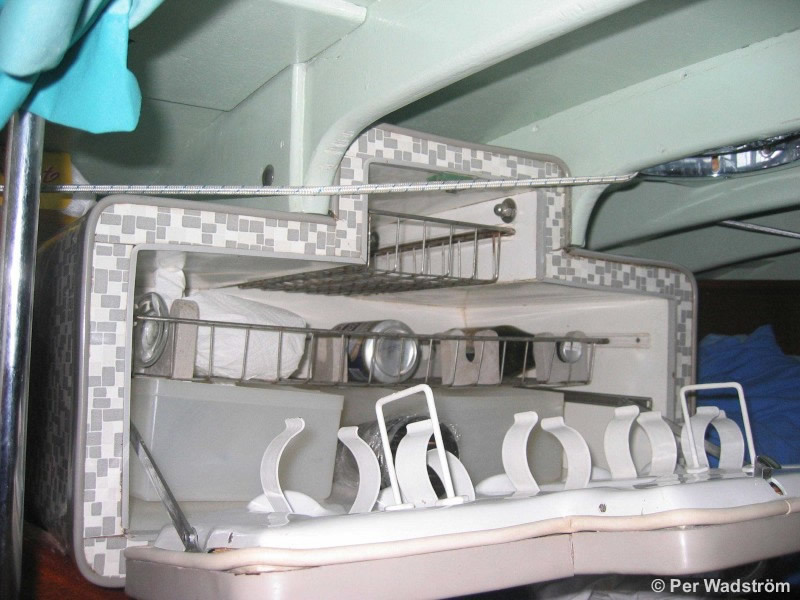 A novelty for the year, and perhaps for the first time in a "runabout", is a marine WC placed in the little cabin! Bow lights becomes an option as well as an ice box for the cabin. Four Tritone are built this year and the last one, # 9, is fitted with the more powerful engines CC MBL at 158 hp and delivered to King Farouk of Egypt. Production increases and many changes are made. In fact this years model could be considered as Tritone Series 2. The boat's structure is made stronger by more frames with C-C 24 cm. The planks on the sides (now in Philippine mahogany) are attached to the ribs with the "Aero Lite white glue", which meant that fewer screws needed, still making the boat stiffer with less risk of cracks in the varnish. Phillips screws are introduced for all hidden mounting and bottom screws by the special material "Everdur" from U.S is applied. New steering box with stainless steel interior is introduced as well as propeller shafts of the new material "Monel". The former bottom planks is replaced by multi-layer marine plywood of birch. The upholstery in the cockpit is now made in a black and white checker pattern with light yellow edge decoration. 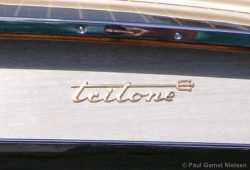 The bottom is still kept darkgreen with white-green-white waterline as it would be for all Tritone's up to 1966, except for some Super and Cadillac models. Total production of the year are eight boats, all are equipped with dual CC ML engines. The price for a Tritone is 7,600,000 Liras ($ 12,460) and very expensive compared to the most luxury cars like Ferrari 410 Superamerica (6,000,000 liras ) or Ferrari 250 at "only" 4 million Liras. Revolutionary for this year's model is the new hood, or rather roof, designed as a real cabriolet that can be folded up or down in seconds. This is made possible thanks to an ingenious design with springs and levers that balances most of the roof's weight. New this year is also the steering wheel which had previously been purchased from car makers including Alfa Romeo. The new steering wheel has two spokes and the Riva logo with "the three little sailors" in the center. 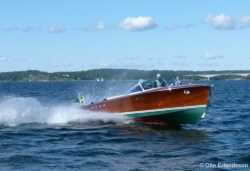 During the year 17 boats are built, all with CC ML motors except Tritone # 33, which is secretly equipped with 2 Cadillac V-8s, 250 hp each. They are converted for marine use by Calvin Connel, owner of Crusader Marine in the United States. The secret is that this model was never presented in the price list nor officially recognized by the yard. Thanks to Carlos investments in marketing by participating in foreign boat shows, the production increases despite the saturation of the Italian market. Half of this year's production is shipped overseas. With the first boat, # 35, a larger and stronger engine, the Chris Craft MCL of 175 hp, is introduced. 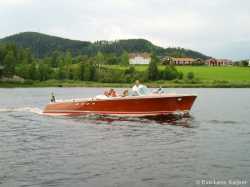 Next boat, # 36, originally sold to Count Perdomini of Goito is now in Sweden awaiting restoration. Boat # 38 was sold to a Mr. Frykman in Sweden and was certainly the first Tritone in our country. From boat # 40 a deck made of plywood, with a top layer of Honduras mahogany with thin stripes of maple wood, is introduced. The intention is to get a water proof deck that also can be easily replaced with new plywood by any yard when it's worn out. 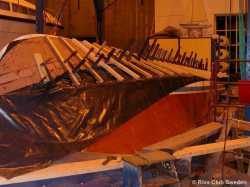 The new technology is developed further and from boat # 44 the transom will also be built with plywood from the company Marine Plywood. 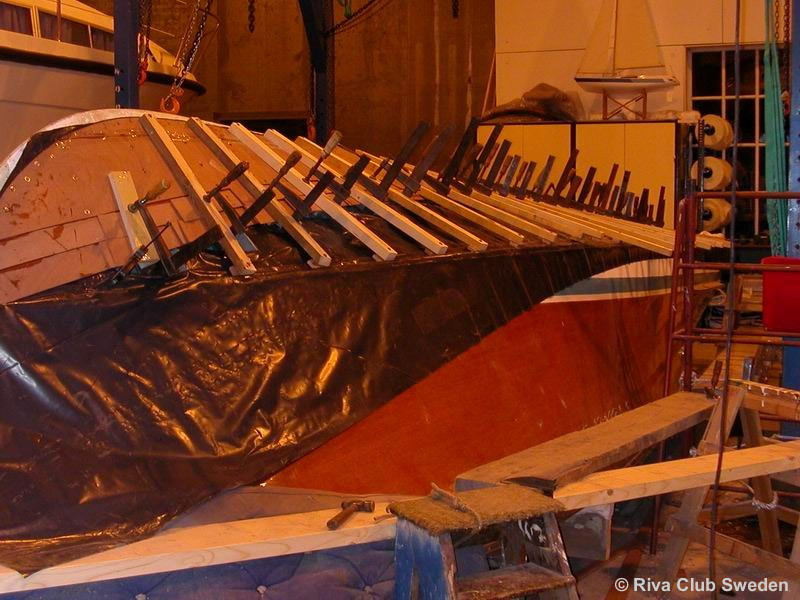 At the same time Carlo Riva start up the first service and restoration yard for the Riva boats. The yard is built just beside the production facilities and is named RAM, which stands for "Revisione Assistenza Motoscafi". 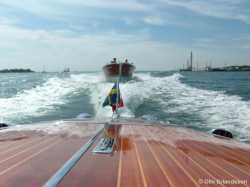 The idea is that the world's best boat also must receive the world's best service, when needed! During this time the yard has big problems with late delivery of instruments from Stewart Warner, USA. To solve the problem Carlo buy's a number of instruments from the English company Jaeger thru their Italian agent. These instruments will then be used in several boats during 1957 and 1958. The bow spray guard is deleted this year and 22 Tritone are produced, including two (# 46 and 57) fitted with Cadillac engines. This year the first "open" Tritone, Tritone Aperto, sees the light when boat #67 and 74 are built with a 25cm recessed sun bed on the aft deck above the engines and aft stowing space. During the year many significant changes of the different boat models are introduced. One of the larger ones are prefabricated sheets of 3-ply wood for the sides. This does not apply for the Tritone model since the sides are considered to large to make in one piece. This will remain true until the Aquarama is introduced. Many small changes are made though, like new adhesives for topsides, new fuel tanks, new type of fuel filter, modified self-draining bilge pump, new anchor, etc.. 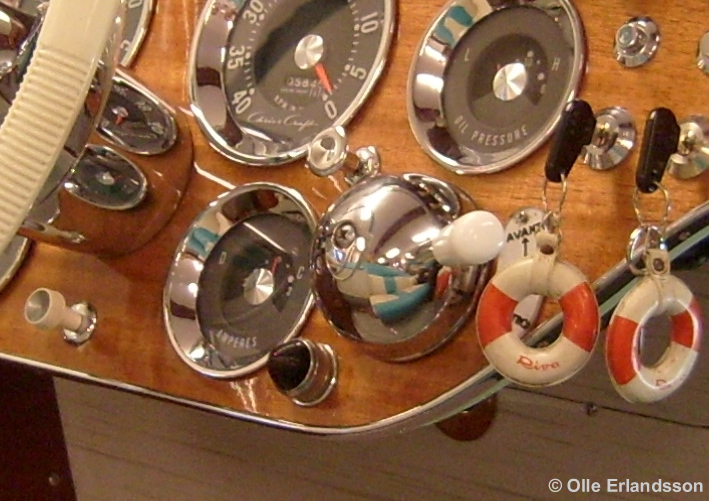 The last boat of the year, # 88, introduces a new instrument panel with the new instruments from Stewart Warner. They have a black panel with large white numbers and a wide chromed frame. 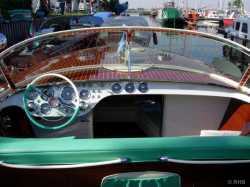 This boat also get the new steering wheel "Calyx", copied from the one used on the -58 Chrysler New Yorker. The Riva version is painted ivory and gets the Riva logo and a small propeller in the steering wheel center. The upholstery is still the same as was introduced in 1955, black and white checker pattern with light yellow edge trim and black padding around the upper edge of the cockpit. During the year a total of 32 Tritone are produced, of which two are the first type Aperto and six are fitted with Cadillac engines, now at 275 hp. Still, there is not a sign of the Cadillac version in the price list! From this year the Tritone Aperto is introduced as a separate model in the catalogue. The typical semicircular Plexi glass holder on the dashboard for small items, tested at # 67 last year, is now standard on all Tritone, as well as the American police siren mounted in front of the windshield on the deck. From boat # 93, delivered to Prince Sadruddin Khan, the spectacular upholstery in zebra patterned vinyl with light green rim decor is introduced. 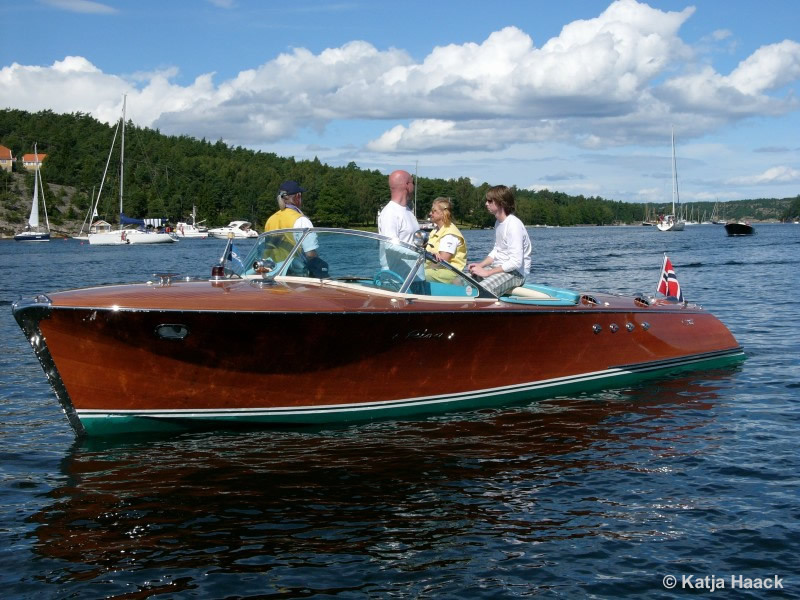 This is not liked by all buyers because of its "upsetting" expression and a number of boats are still made with the former upholstery design. From boat # 98 a new support strut for the propeller shaft is introduced. It's angled sideways to better fit the bottom, which means that they are now different on the starboard and port side. On boat # 109 and 110 new engines are tested. 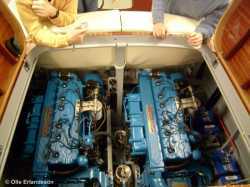 It's the Chris Craft 8V 283 /185hp V8 engine with overhead valves that 5 years later will become the standard engine. This is one of several attempts to find a more modern engine to replace the old side valve MCL engine. 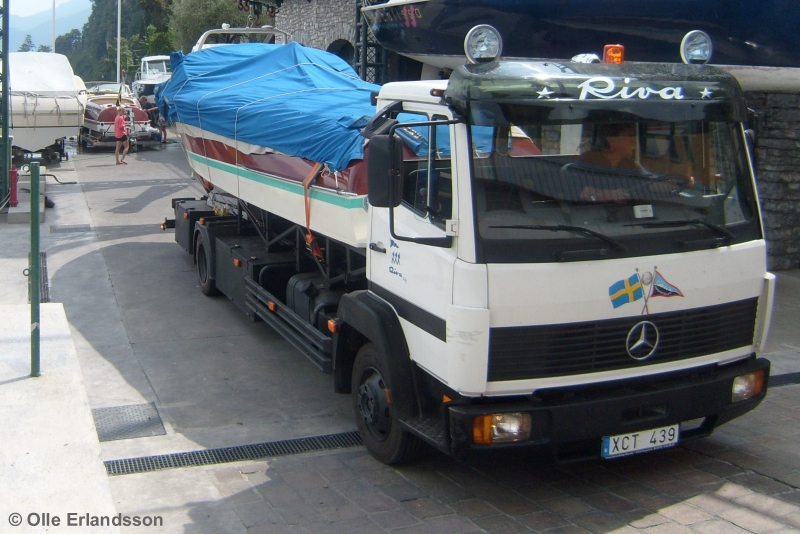 Boat # 113, originally delivered to Lake Como and the textile manufacturer Achille Roncoroni, is since many years in Sweden. In the last years it have been totally restored to a perfect condition by a member of Riva Club Sweden. It's original engines, the CC MCL with the problematic "Chris-O-Matic" reverse box, is preserved and has been replaced by modern V8 engines from Crusader for better performance and manoeuvrability. 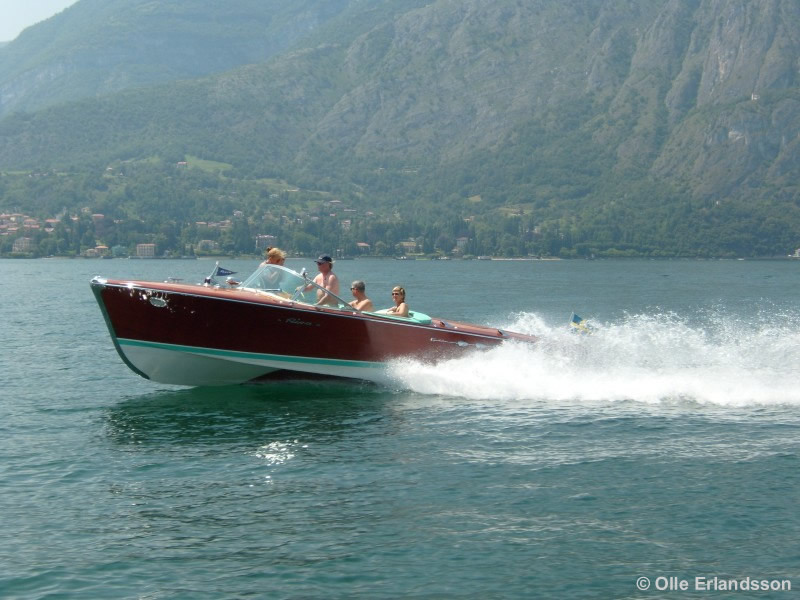 As for many other Riva models, this is a year of great and many changes. The most important one is the change to a modern overhead valve engine. With the choice of the Chrysler Sea-V M80 V8 at 177 hp also a new supplier (Chrysler corp.) is chosen. 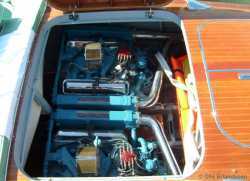 The reason for this is that Carlo Riva realize that Chris Craft is more of a contestant on the world market for runabouts than just an engine supplier. Changing supplier means that the old Riva-Chris-Craft logo on the dashboard can be replaced by a special name logo for each Riva model. 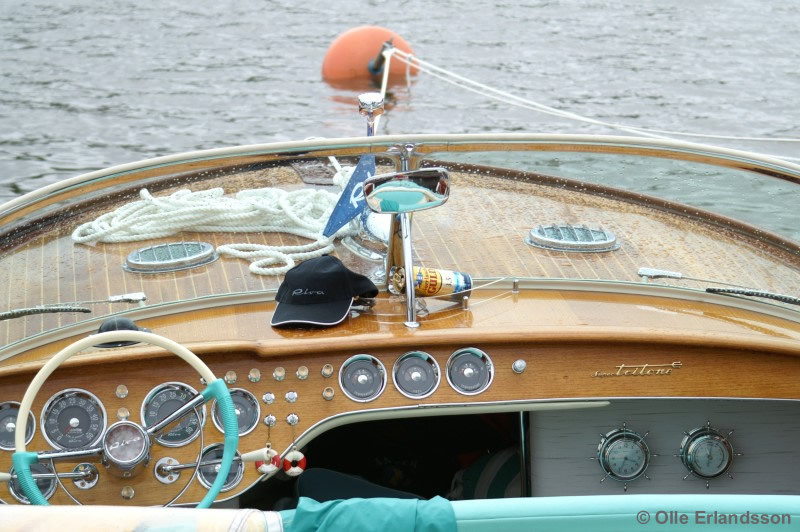 Also the instruments, still supplied by Stewart Warner, is marked with the "Riva" logo instead of the former Chris Craft one. 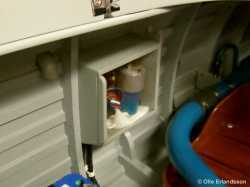 Changing engines also means an update of the electric system to a modern 12 Volt one. The sometimes troublesome electro-hydraulic reverse system is also replaced by a modern direct-acting hydraulic reverse box. Other important changes are the switch to chromed Phillips screw of silicon bronze (Everdur) for all the trimmings. These are certainly more expensive, but also stronger and the screw heads don't have to be aligned with the water line. Many minor changes, as lighter on the dashboard, new stainless steel tanks, larger sun bed, new upholstery for the floorboards and modernized logo for the name "RIVA" on the hull sides are introduced. A new Tritone model is also introduced in the form of the Super Tritone. 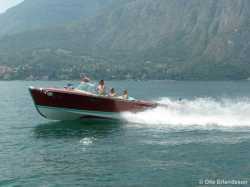 As on other Riva models it means more power and a slightly longer hull. 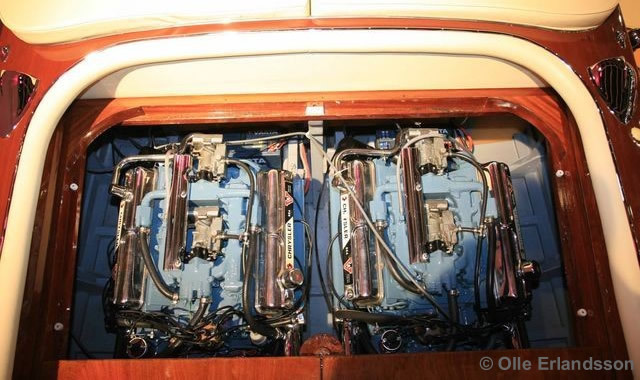 The Super model are fitted with double big block V8s from Chris Craft with a displacement of 431 cubic inches (7 litre) and 275 hp. An exception is the Super Tritone # 134 where 2 Ford Interceptor engines at 215 hp each is installed as a test. 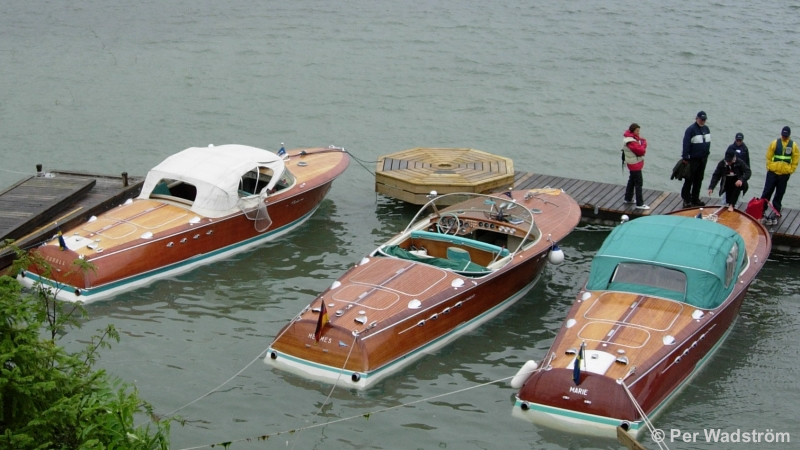 The Riva yard was now allowed to use the Chris Craft engine without the Chris Craft logo on the dashboard. As mentioned the Super Tritone was extended in length compared to the Tritone. The reason for this was to make room for larger fuel tanks in order to get the same operating range with the heavier and more fuel consuming engines. The data on how much the Super was extended vary, but the overall length is stated to be 8.25 m. Another statement says that the extension would be 29 cm, but in that case the usual Tritone would be 7.96, which is contrary to other sources. Probably the truth is that Super was 8.23, that is 29 cm longer than the 7.94 (Tritone length) or maybe 8.22, which is the length specified for subsequent model years. A unique boat built this year is # 132, which is made 8.30 m in length and provided with double Cadillac engines each at 320 hp. 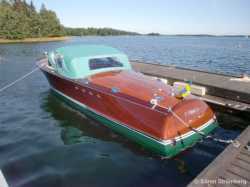 The boat is called "Tritone Speciale" in the records and is the last Tritone ever to be equipped with engines from Cadillac. Standard upholstery for both Tritone as S. Tritone is the usual black and white checker seats with yellow borders and green hood. 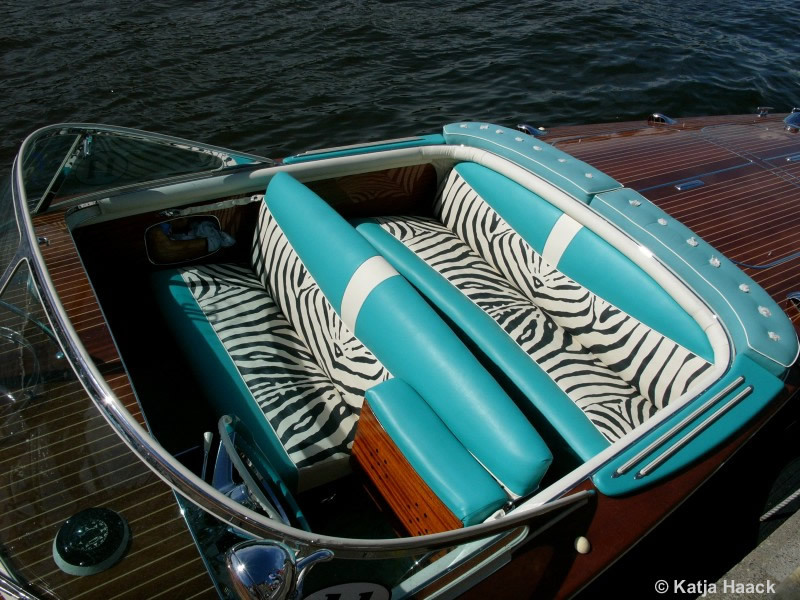 As an option, there was the zebra striped upholstery with light green trim. Some S. Tritone was however made with ivory ribbed seat and backrest with light green decor. The water line on the Tritone is still in white-dark green-white stripes while the Super for this year gets a yellow-dark green-yellow striped line. Total number of boats this year is 30, divided into 18 standard Tritone, three Tritone Aperto, eight Super Tritone and the above mentioned Tritone Speciale. One of these, the Super Tritone # 137, originally delivered to Prince Sadruddin Khan and now owned by a Riva Club Sweden member, have been cruising the waters of Stockholm for many years. The boat is special in the way that it after delivery from the Riva yard was converted to an Aperto. Tritone gets a more inclined bow and grows 8 cm in length to 8.02 m, while the width stays at 2.62 m. In the registers for each built boat the length of the Super Tritone #166 is specified to be 8.22 m, although other sources say 8.25 for the Super model. New upholstery is introduced with ribbed ivory vinyl seats and backrests with a V-shaped decoration in light green. The cushions covering the hood space (cabriolet garage) behind the rear seat is made of a similar light green fabric and the footrests at the sides are dressed in the same light green vinyl as the seat trim decoration. The waterline retains the same colors as before and the bottom is still in dark green. The dashboard get new buttons and a compass on top of the dashboard becomes standard equipment. Minor changes are made of the Chrysler engines, like new thermostats, easily replaceable oil filter and most important, a new flywheel housing for the engines delivered to the Riva yard. The reason is that this cover, which also acts as forward engine mount, often crack and break when the boat hits the waves. Beginning with Super Tritone # 169 a deeper V hull from main frame #4 and onwards is introduced. This change is also implemented on subsequent following Tritone's. The production of the year increases to 32 boats including six Super Tritone and six Aperto. The list price of a Tritone is $14,960 while the Super is for sale at $18,400. This is significant more then luxury cars of the year, like a Ferrari priced at $9,150 or a Mercedes 300 SL at $11,700. The first boat for the year is # 180 and with this boat a rear view mirror on the windscreen is introduced as standard equipment on all Tritone models. 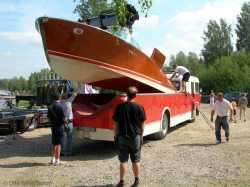 Except for a few experimental boats there are only minor changes during the year. Super Tritone # 207 is built like an Aperto, despite the larger big block engines, and becomes the only Super Tritone Aperto built by the yard itself. Tritone #214 is taken out of production line and is modified until it becomes the very first boat of the successor to the Tritone: The Riva Aquarama. This boat get a larger an more elegant form of the sunken sun bed then the former Aperto. The sun bed is followed by a sunken gang way in the aft deck all the way to the transom, thus reducing the risk of falling over board when mooring or entering the boat. The fore deck is modified with a raised edge around, thus making even fewer people falling over board when mooring and anchoring. An anchor winch is mounted at the bow under a nicely designed mahogany hatch. 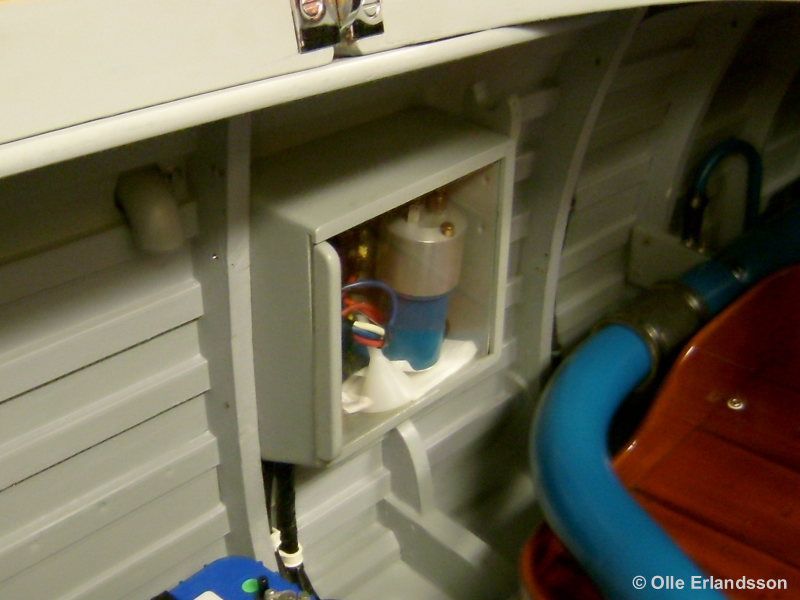 A new and more modern designed model of the engine ventilators replaces the older ones on the sides of the hull. The cockpit is also updated with a new and very smoothly designed instrument panel made of Honduras mahogany. The upholstery gets a new design with ivory seat and backrest with black decor fields and orange piping. The cushions on deck behind the rear seat is made of orange vinyl as well as the footstep plates. The most functional change is the division of the front seat in a single driver seat and a double passenger seat, thus making the movement around in the cockpit much easier. 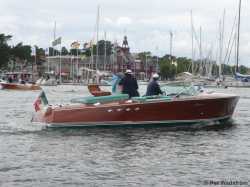 The boat is named LIPICAR after Carlos daughters Lia, Pia and Carla and is used as test boat by Carlo Riva himself. 1962 will be a record year for the different Tritone models and 36 boats are built, including the # 214th. Seven are of the model Tritone Aperto and another seven of the Super version, including the one and only Super Tritone Aperto. 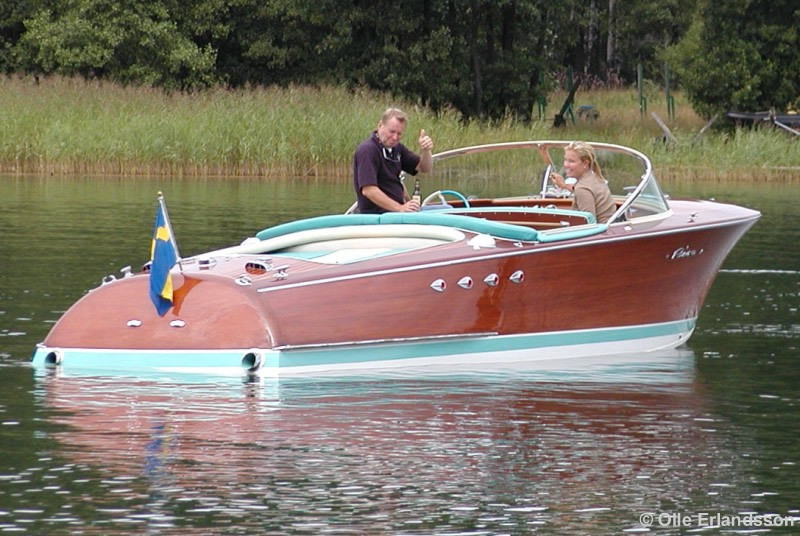 The first boat of the year 1962, Tritone #180, is cruising in Sweden since many years under the name "Claudia". 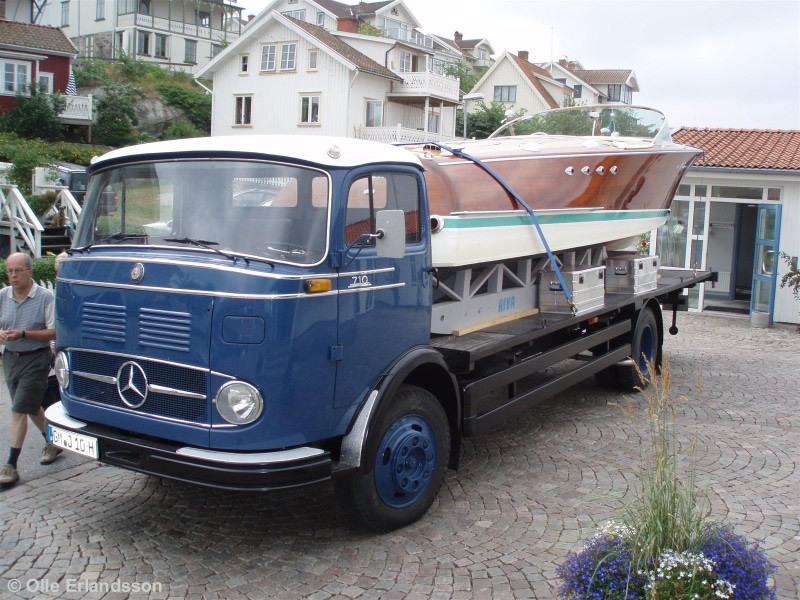 The boat and its owner is a faithful participant at the Riva club's annual meetings and also appears on the roads when moving around with his custom-built Scania bus from the 60's. 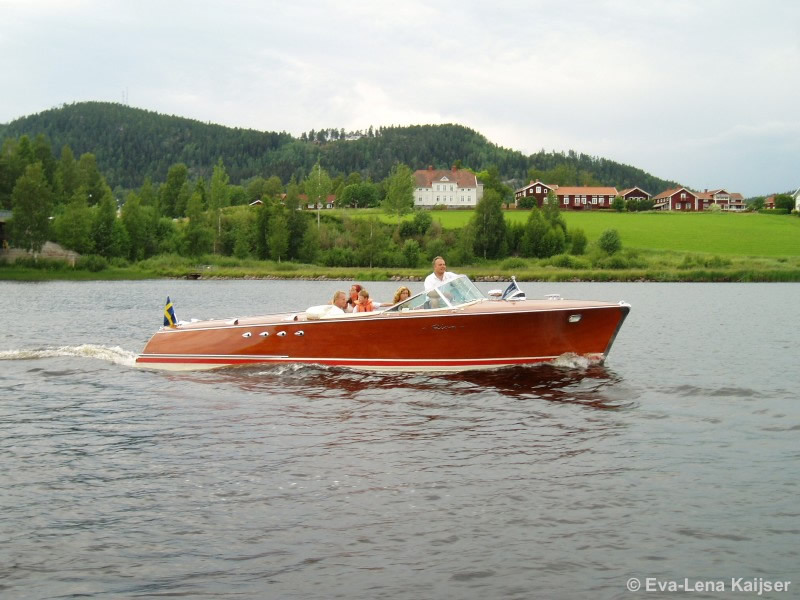 Tritone # 209, named Corall, is also a well known Riva in Sweden. Its used every summer since many years with home port in Nynäshamn south of Stockholm. The production of the Tritone decreases dramatically this year when the yard prioritize the new Aquarama. The decrease is partly because the Tritone share the hull jigs with the Aquarama and therefore the same assembly line in the "factory". Only ten Tritone and seven Super Tritone are built this year while the Aperto is replaced by the new Aquarama. 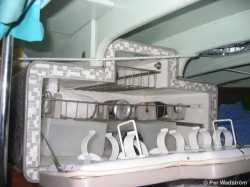 Since the hull jigs are shared it means that any changes to the Aquarama hull also are implemented on the Tritone. Among other things the transom width is slightly increased to 1.82 m. Better sound insulation in the engine room and quieter mufflers is also a benefit from the Aquarama. The seven Super Tritone built towards the end of the year, starting with #226, will all get the new fore deck with integrated anchor locker, new nose piece (The "Crocodile nose") and the raised anti-slip edge on the deck side. Also the new dashboard is used for these last seven Supers. 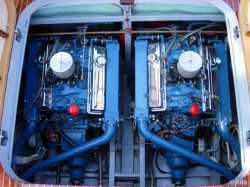 New engines is also introduced in the form of twin Chrysler M413-D Golden Lion at 413 cubic inches and 290 hp. The capacity of the fuel tanks increases to a total of 480 liters. These last Super Tritone get the same white color for the bottom as the Aquarama but a waterline in red-white-red stripes. One of the very last Super Tritone, # 229 is in Sweden since many years. 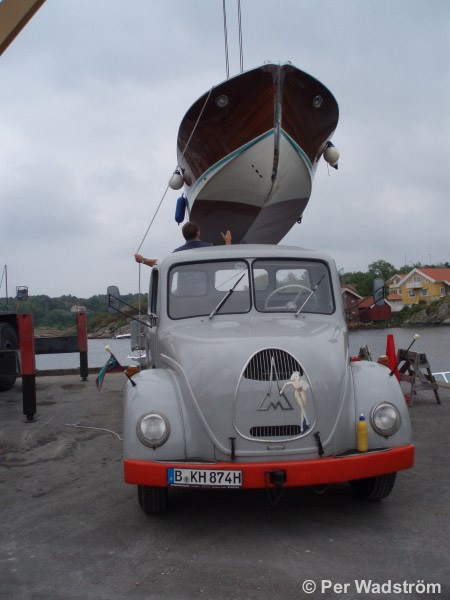 It was bought from Italy in a very bad condition, requiring a several year long restoration, and is now kept by its owner in Vaxholm just outside of Stockholm. 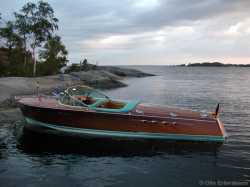 After the restoration it has taken part in a lot of meetings in Sweden and south Europe. Production decreases further and only 12 Tritone is built this year. Despite of this a number of changes are made as a result of the development of the Aquarama. The Chrysler Sea-V engines used for many years is now replaced by GM engines with Chris Craft logo on (CC 8V 283/185 hp). 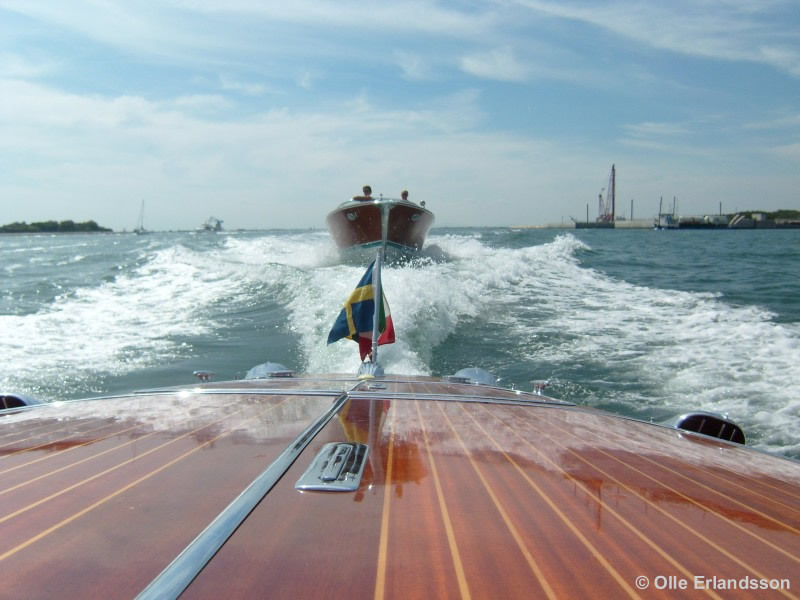 Carlo didn't like to be dependent of Chris Craft, but was forced to choose this solution since Chrysler, as a major car producer, had no particular desire to make all the changes for the engines that the small Riva yard asked for. Carlo doesn't have to by instruments together with the new engine and the new Riva instruments from VDO, tested for several years, are introduced for all Riva models during the year. 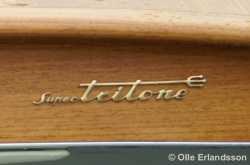 This year also the Tritone, together with the Aquarama, gets the preformed hull sides of 3-ply mahogany wood. Tritone is thereby the last model that ends up having traditional planked hull sides. From Tritone # 239 the hull form is slightly changed and the bottom gets a deeper V (6 cm) to make the journey more comfortable. As introduced on the previous years Super Tritone also the Tritone are equipped with the new engine ventilators on the sides. Officially no Super Tritone is built, but one of Carlos loyal customers, Mr. Ernst Petschek from New York, succeeds to persuade Carlo to build Super Aquarama # 38 as a Super Tritone on his behalf. Only six Tritone are built and no significant changes are made, except for a new fuel tank valve. 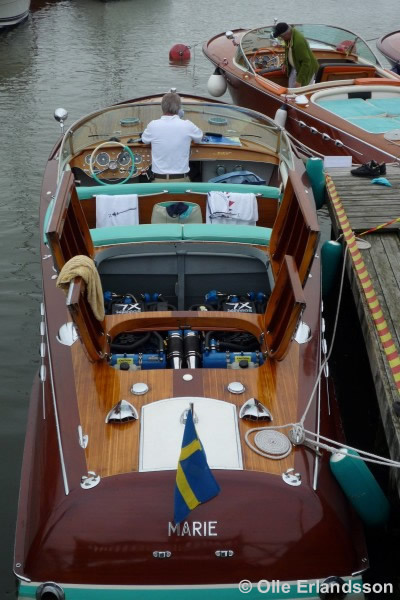 The buyer of # 248, Mr. JE Hanson in London, manage to get his boat delivered with the same divided front seat that the Aquarama have, but with the Tritone upholstery in ivory and light green color. 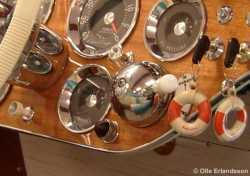 This is the last year when the Tritone is included in the price list and eight boats are built. 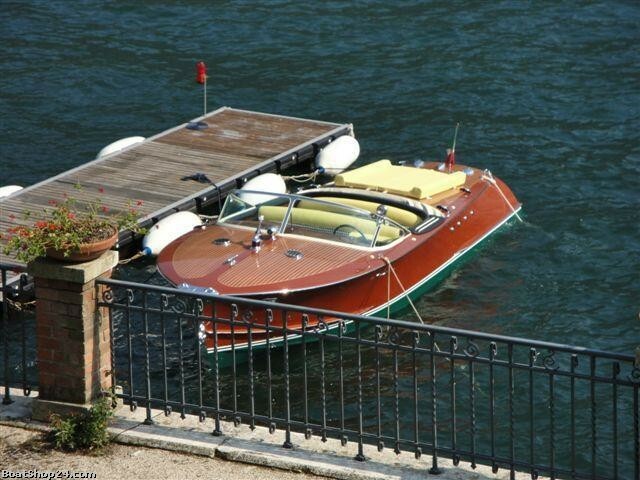 Later it turns out that some of his customers will really miss this model in the range of the Riva yard. 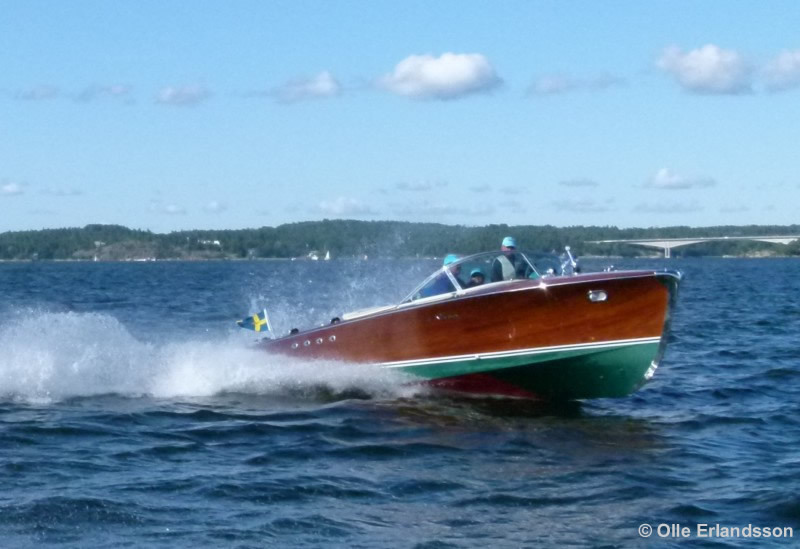 The last Tritone built as a series boat, # 258, is today owned by a German and have often participated in our Swedish club meetings. It has recently (2011-2012) been restored to absolute mint condition. This could have been the end of the Tritone history if it wasn't for a certain Mr. Petschek from New York ... In 1970 he succeeds once again, through Monaco Boat Service, to convince Carlo to build one more Super Tritone of what actually would have been Super Aquarama # 393. The boat is built with a covered aft deck and a one piece front seat, just like a real Tritone! Carlo the Legend, Riva the myth. Book V-VI by Piero Gibbelini. 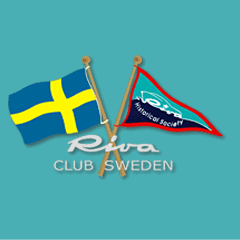 -Viva Riva. Riva Historical Society quarterback magazine. -Pictures from my own and others archives, RHS and other miscellaneous sources. Tritone logo on Formica instr. panel from 1960 and up. Super Tritone logo on #226-#232 with Aquarama panel. Super Tritone logo on sides with the new ventilators from the Aquarama in 1963. The famous engine ventilators used from Tritone #1 to the last one, except for the last 7 S. Tritone's. 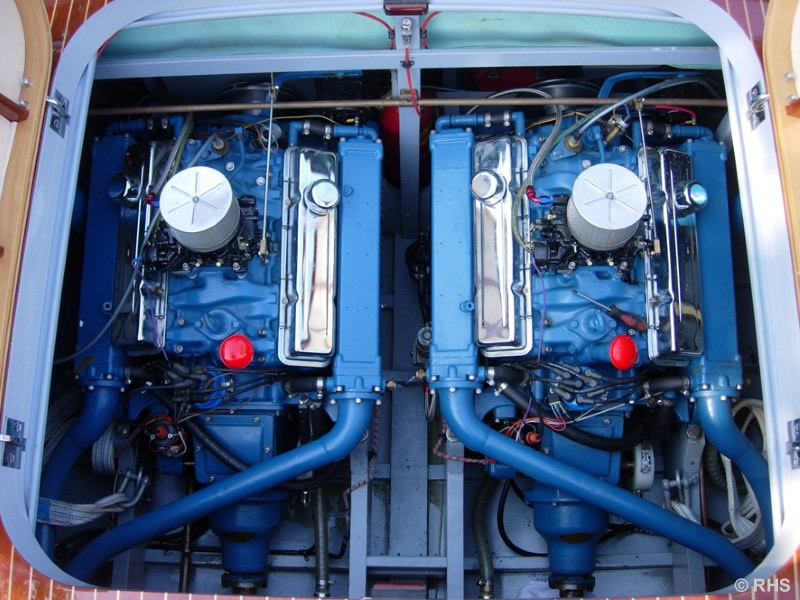 Chris Craft MCL engine (175hp) used 1957 -59. The electric hydraulic pump that execute gear change on all Tritones with the "Chris-O-Matic" system. The short control lever on the dashboard for the "Chris-O-Matic" gear system. 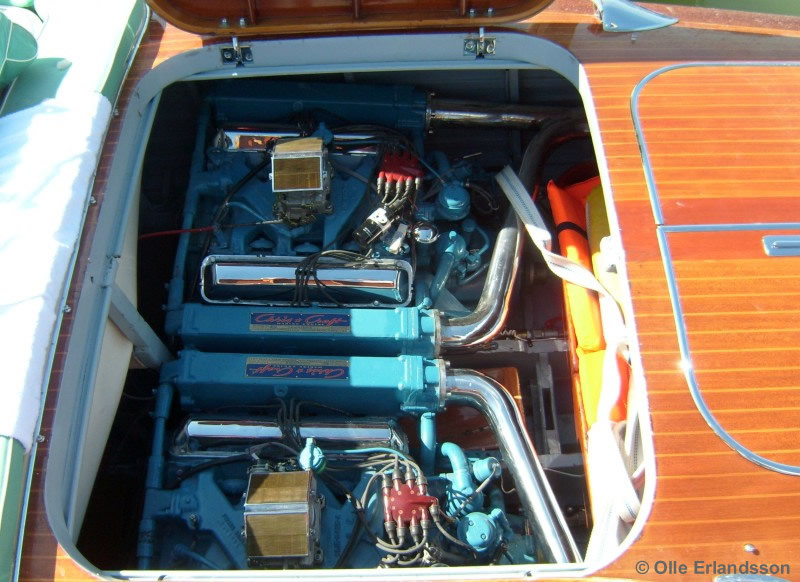 Chris Craft 431 big block engine (275hp) for Super Tritone 1960-62. 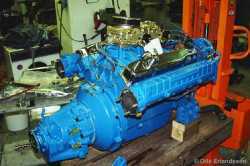 Chrysler M413D big block engine (290hp) used for the 7 last built Super Tritone in 1963. Tritone #36, 1957. In Sweden and waiting for restoration. 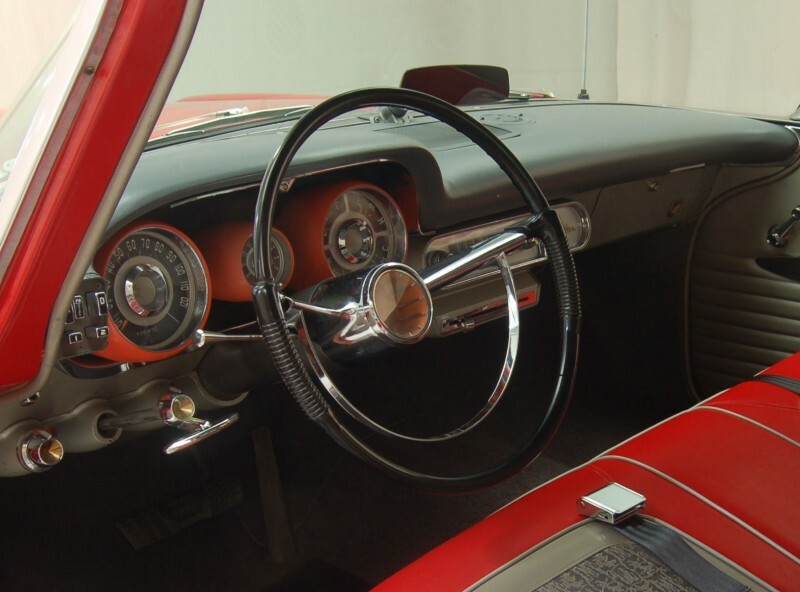 Tritone #110, 1959 "Loredana" with the new steering wheel "calyx" based on the 1958 Chrysler New Yorker wheel. The original Chrysler New Yorker 1958 steering wheel. Tritone #113, 1959 "Patrizia" in 2008 after restoration. 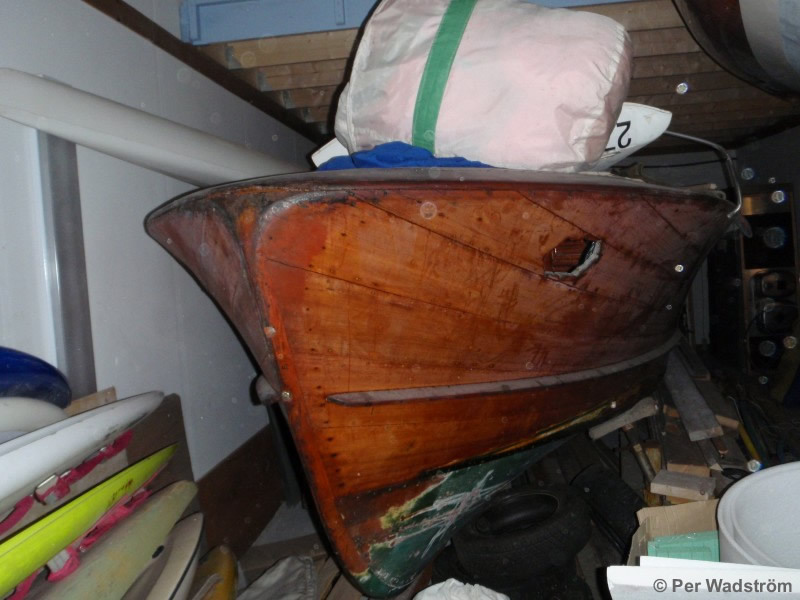 Tritone #179, last boat from 1961, sold to Norway and still there. Tritone #179, last boat from 1961, originally sold to Norway and still there. Tritone #180, "Claudia". 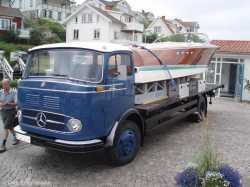 First boat built in 1962. In Sweden since many years and often seen at meetings around. Tritone #180, first boat in 1962. In Sweden since many years and often seen at meetings around. Tritone #180 being launched from it's famous modified Scania bus. Tritone #209, 1962 "Coralle" having bottom changed in 2003. 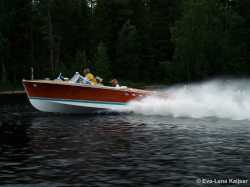 Tritone #209 under Full Throttle at the meeting "Riva River Dance" in Sweden 2006. Tritone #209, #258 and Super Tritone #229 outside Stockholm in 2007. Tritone #223, 1963 "Graal" at the Swedish Run&Fun meeting in 2007. 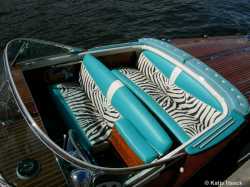 The spectacular Zebra upholstery of Tritone #223 "Graal". Super Tritone #229, 1963 "Marie". In Sweden since many years, but here at Lake Como in 2009. 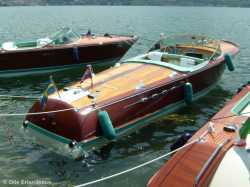 Super Tritone #229 at Riva Days in Lake Iseo 2009. Instrument panel on Super Tritone #229. Same as Aquarama model and only used on the last 7 Super Tritone. Super Tritone #229 "Marie" at Run&Fun 2011 with all hatches open. Tritone #140 visiting Sweden in 2006.